Chanteuse Country US née Margo Rae Price, le 4 Avril 1983 à Buffalo Prairie (Illinois). US Country singer born Margo Rae Price, April 4, 1983 in Buffalo Prairie (Illinois). Margo Price might be something of a throwback, not only styling her country music after the classic sounds of Loretta Lynn, Tammy Wynette, and Emmylou Harris, but also writing like a classic '70s singer/songwriter. She has an eye for details and a knack for narrative that help keep her brand of traditionalism from seeming like nostalgia on her debut, Midwest Farmer's Daughter, an album recorded at Sun Studios and released on Jack White's Third Man Records in 2016. 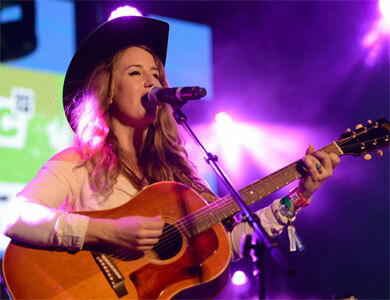 Like White, Margo Price is a Nashville transplant who originally hails from the Midwest. A native of Aledo, Illinois -- a small town near the state's Western border -- Price grew up singing in church and wound up studying dance and theater while in college. Once she reached the age of 20 in 2003, she decided to drop out and head to Nashville, where she slowly started working at a musical career while working odd jobs. She met a bassist named Jeremy Ivey and soon the two formed the group Buffalo Clover; the pair would later marry. Between 2010 and 2013, Buffalo Clover released three independent albums. Once this band split, Price assembled Margo & the Pricetags, a band with a revolving lineup that sometimes featured future alt-country star Sturgill Simpson. Price financed a solo album she recorded at Sun Studios in 2015 and, after hearing through the Nashville grapevine that Jack White was a fan of hers -- he spotted her at local showcases -- she sent him the album. Impressed, White signed Price to Third Man Records and released the album as Midwest Farmer's Daughter in March of 2016 -- the LP garnered nearly unanimous critical accolades. In July 2017, Price released the four-track Weakness EP, whose title track wound up as the first single from her second album, All American Made, which appeared in October of that year.